New laws signed today address challenges highlighted in Jerry Brown’s first term – in the 1970s. 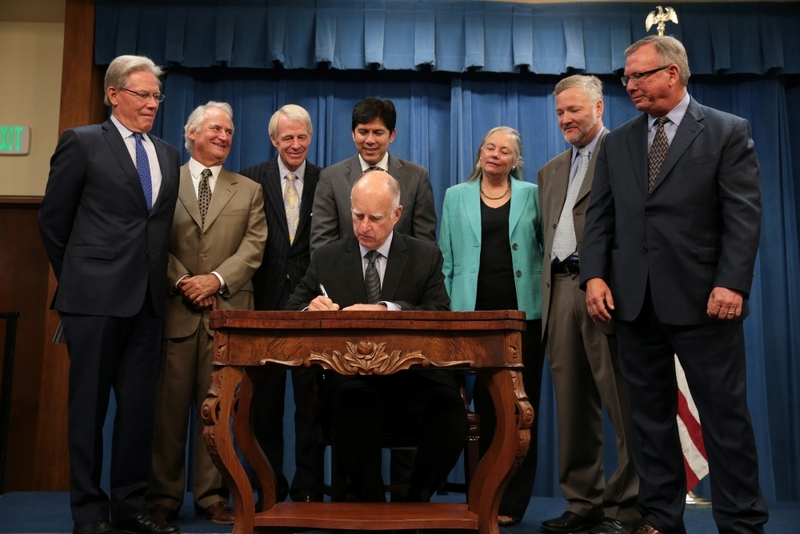 Governor Jerry Brown (D), backed by members of the California Legislature, signs groundwater legislation on September 16, 2014. Click image to enlarge. Drought in California today did what drought a generation ago could not – secure the passage of legislation that requires tighter controls on groundwater use in one of the few states without such measures. The three bills signed this morning by Governor Jerry Brown are the first step in what will a long road to groundwater balance. The bills set a series of deadlines ending in 2040, when all of the state’s 515 groundwater basins are supposed to achieve “sustainability,” a term as yet only vaguely defined. Brown, a Democrat, could be forgiven if he felt a sense of déjà vu at the signing. The language of the bills, as he noted, looked oddly familiar. During Brown’s first term as governor in the late 1970s, California, as today, was rocked by a historic drought. The lack of moisture was so pervasive that he appointed a commission to review the state’s laws on water rights. In a report published in December 1978, the commission unveiled its findings. Four areas of the law merited change, the 10-member panel concluded. Groundwater law was one of the four. The commission’s analysis, now 36 years old, reads like a report fresh from one of the many think-tanks and policy groups so active in today’s groundwater debate. The remedy proposed then was similar to the bills signed today: prod local agencies into action. The new laws, however, carry more weight and a stronger stick. State agencies will stand at the ready if local plans are deemed inadequate. A generation ago, the water rights report landed with a thud, but groundwater reform did not come to be. The new laws, which were opposed by farm groups and many Republican lawmakers, will have a far more invigorating effect. By June 1, 2016, the Department of Water Resources must adopt rules for evaluating local groundwater management plans. And by 2020 the first batch of local plans are due. That means lots of chatter in the next few years in California about how to define sustainable groundwater use and how to achieve it.